Obstructive sleep apnea is commonly misdiagnosed or overlooked in children and infants, but it’s essential to know the signs and symptoms. Obstructive sleep apnea (OSA) is much more common than many people think; it is estimated that between one and four percent of children have OSA. Unfortunately, OSA is largely misdiagnosed or overlooked altogether, but every parent should understand what OSA is and what causes it, and they should also be vigilant about watching for the signs and symptoms of OSA, because, when left untreated, OSA can in dangerous or, in some cases, even life threatening. What causes OSA in infants and children? While the most common causes of OSA in adults center around weight, age, and neck circumference, a child’s anatomy can play a big role in the development of OSA. These anatomical blockages can include narrow dental arches and a retruded lower jaw. Enlarged adenoids and/or tonsils, as well as obesity, can also play a role in the development of OSA in children. However, obesity is thought to contribute to the development of OSA in older children, between the ages of 12 and 18, but it’s not as common in younger children. OSA is often misdiagnosed in both children and adults. In adults, it’s estimated that as many as 90 percent of cases are undiagnosed or misdiagnosed. In children, OSA is often misdiagnosed as either attention deficit disorder (ADD) or attention deficit hyperactivity disorder (ADHD), because the symptoms are very similar. In fact, roughly 25 percent of children diagnosed with ADHD are thought to actually have sleep apnea. What are the signs of OSA in children? Because the signs and symptoms of OSA are most obvious during sleep, many parents don’t catch them. However, there are signs of OSA that can make themselves known during the day as well. 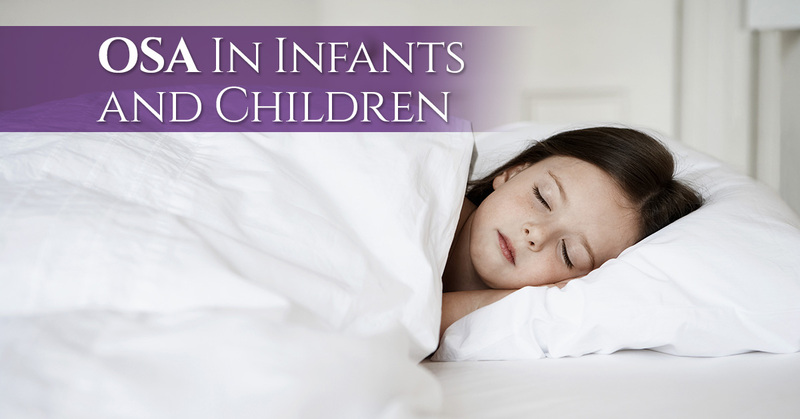 What are the signs of OSA in infants? Spotting the signs of OSA in infants can be even more difficult than spotting them in children. It’s essential for parents to observe their babies while sleeping to watch out for the symptoms of OSA. What should you do if you think your infant or child has OSA? If you think that your infant or child is suffering from undiagnosed or misdiagnosed OSA, it’s important to consult your physician. Left untreated, OSA can lead growth, behavioral and developmental problems and delays, as well as poor academic performance . Early diagnosis is an essential part of preventing the majority of the issues associated with OSA. OSA is typically diagnosed with an overnight polysomnography or a sleep study. What does our dentist in Lawrence have to do with OSA? Dentists have become key in diagnosing OSA in children that can be overlooked by primary care physicians. Dentists can evaluate enlarged tonsils and/or adenoids during a dental exam, as well as other developmental markers that increase the risk of OSA. Our dentist is an expert in sleep disorders in both adults and children and offers sleep apnea treatment information and options that can resolve OSA.